The organization has a clear and well-agreed-upon one GOAL. Usually with a set of necessary conditions that must apply, but when valid there is no desire to get more from those conditions. For instance, maintaining good level of employee satisfaction and also client satisfaction and trust. The performance of the organization is NOT CHAOTIC. The above axioms are not valid everywhere, but they are absolutely necessary for the TOC approach to be useful. I have seen organizations, naturally not-for-profit, with critical disagreements between several powerful leaders about the goal and how to measure it. Many universities live in constant internal struggle between different research fields and between research and teaching. Many performing art institutions are in the same situation: struggle on what should be the goal and how it is measured. When it is impossible to know whether the overall performance last year was better, worse, or about the same as the year before then I’m afraid TOC cannot help. I treat an organization as chaotic when there is high uncertainty in the delivery to clients. When an order might be delivered today, or only in three months and even that is not guaranteed then the organization is in chaos. However, it seems that a chaotic organization is doomed to die pretty soon and I doubt whether TOC intervention can stop the fall. Chaos in an organization is usually caused by several interactive constraints that suddenly emerge. Most organizations naturally solve the chaotic situations quickly by adding capacity when the first signals of too much noise in the delivery are identified. The others simply die. When both axioms are valid then TOC can be applied. The target is to lead to ongoing and significant improvement in the performance of the organization. When an idea aiming at improving the performance is considered “not TOC”? When TOC logical analysis, based on cause and effect using the categories of legitimate reservations (CLR), claims that either there are no benefits to the idea, meaning no evident improvement in performance, or that there are severe negative branches, which are likely to cause bigger overall damage, then the idea is flawed and one might call it “not TOC”. I prefer to point to the flaws of the idea, rather than describe it as non-TOC. Checking the validity of cause and effect arguments is not hard science. See my previous post on The Thinking Processes and Uncertainty. We all use certain beliefs that we treat as truth, but there is no logical way to validate or invalidate them. How can you treat a claim that if “one prays every morning” then “higher performance is achieved”? I don’t like to deal with religion, it is just a reminder to the limitations of logic to give us full and secure judgment on the validity of an idea to improve performance. TOC has its own beliefs and observations that look as common sense that guide the TOC thinking and solutions. The four pillars, presented by Goldratt, summarize the most important ones. The four beliefs above are tied to basic philosophy that enables the TOC thinking and methods. However, the four pillars are not black-and-white orthodox beliefs. Even if in a certain environment one of the beliefs is not fully valid then TOC is still applicable. For instance, when I see an environment that does not look simple and harmonious, I should still try to look for the inherent simplicity, but not necessarily wait until I see it – I should do my best to come up with the best improvement I can think of. The same goes for facing a conflict without realizing how to evaporate it. I’d realize my solution is limited, but it is the best at that time. The belief that “People are good” requires an interpretation, because as a general belief I cannot accept it. However, as an initial guideline it is very beneficial. The point is when we assume that people are good then we are able to outline their perspective and interests and then understand their actions. So, when we see something we don’t like, this initial assumption guides us to understand. Then we can better judge whether a specific person is good. The statement “this is not TOC” is irrelevant to the judgment of any idea and it should not be used within the TOC community. I don’t care whether the idea has been conceived using the TOC tools or guidelines. Be aware that the current TOC tools do NOT guaranty inspiration! The TOC guidance might push us towards it, but we also might miss it. As Goldratt said: Never Say I Know! Eli, this is a lovely post. I am amazed that you can produce such a series of deeply thought through, useful and interesting posts with the frequency that you have. Taken together I hope these posts are an accumulation of your thoughts that will one day become a comprehensive book of your philosophy of TOC. Thank you Henry, it is really my intention to eventually come up with a book focusing on how to deal with common and expected uncertainty, which I look as equivalent to “Never Say I Know”. I wonder whether publishing my thoughts on a blog is not an alternative way to spread the ideas, rather than work hard for a year or so (you can tell me how long it took you) and then publish it as a whole hoping to get people reading it. I learned the lesson that the fact people buy the book does not mean they read it, and if they read whether the ideas are understood. I truly wonder whether letting all the posts be available as they are now is not a better idea. The obstacle is that people are not used to go on a blog looking for old posts, because blogs are still understood to be like news, and there is nothing more irrelevant that old news. I have consolidated all your blog posts till date and converted into Kindle Format which I can carry with me to read at my convenience! Blog v Book shouldn’t be an either/or question. Do both! Look forward to the book version, as well as to reading the blog posts in the meantime. I make comments about four pillars and suggested the adding one more pillar. Inherent Simplicity – Is necessary to focus. Every Conflict can be removed – Is necessary accept the trade-off to removed conflict. People are good – Evaluate and do not judge. Never say i know – Principle of evolution. Questioning – Questions forever. The TOC is based on questions. The questioning can be the base of the pillars. Disregard my last comment, there are an error. I did some comments about four pillars and suggested the adding one more. The questioning can be the base of the pillars also. Robson, isn’t “Never Say I Know” means we need to come up with questions? you called it the principle of evolution, and I think that questions are a practical mean to evolution. Fantastic post, thank you for stimulating my thinking. I agree with your proposal. This feels as if it leads us right back to a definition of the Theory of Constraints. Great article Eli! It would be wonderful if all TOC Community think like you. “That is not TOC” sentence should be removed from our vocabulary. this guide me to think again, TOC is not only about mastering tools and applying them but Lean & SIX-SIGMA are. is that touching the truth from any side? is that is why the 5 focusing steps never stop “go back to #1, find the constraint again and again”. I am just trying to learn how to think. Mohammed, there are certainly other methods to outline thoughts and encourage new thinking. TOC is always holistic, putting the goal in the centre, and the categories of legitimate reservations provide good guidance how to check the validity of the cause and effect. I also think that highlighting the search for negative branches and the push to find ways to eliminate them, makes the TOC tools very effective. It works well for me. I don’t know how to compare the effectiveness of different methods for trigger thinking and brainstorming. The loop idea in the five focusing steps is to push you to go ahead. Other methods use similar loops as well. The overall philosophy of TOC, including the four pillars, is even more important than the tools, as it gives broad guidance for the direction of the thinking. Eli thank you very much for this post. I’m young TOC practitian but already met such TOC “domini canes”. Despite agreeing that we should not say “This is not TOC” it is good to know and explicitly state the boundaries of any given field of knowledge, TOC included. I also get quite worried when people claim “this is not TOC” in order to defend or attack a position. The 2 criteria are in fact not a criteria to determine if what we do is TOC or not. Only if TOC is advisable/effective or not. You state this, but the order in which this topic appears might give the impression these axioms are necessary to say that something is TOC. The pillars are another matter: they really constitute what can be considered TOC: if any initiative abides by them then it is safe to call it TOC, if not there is a good cause in stating the initiative is not TOC. Let me elaborate: the pillars are criteria that should be pursued actively and explicitly in any initiative that can be called TOC. For instance if an initiative proposes a solution for a problem that increase the complexity of the organization or if blames people, etc. it is appropriate to call it not TOC. Even when our own personal limitations stop us from abiding to one of them we should be honest and call this instance “non-TOC” as well. 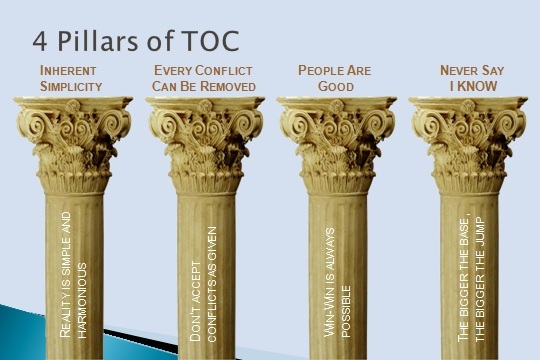 And specifically I consider five pillars, and not 4, to be the base of TOC. On your list there is one pillar missing the “Don’t optimize in the noise” pillar. This particular one was stated by Eli Goldratt only in the preface to the – unpublished – “The Science of Management” as one of the attacks on three fundamental fears. Even if we don’t count the unpublished work as cannon we can easily look at the role of buffers in TOC and see that they do not stem from the other pillars and due to their importance should merit one axiom for themselves. The other 4 as the illustration goes are a bit jumbled: the first pillar “Reality is simple and harmonious” is actually 2 axioms in one, the next two (“Don’t accept conflicts as given” and “Win-Win is always possible”) are versions of one another combined with an absent/implict pillar: “People are good”. And the last one should be “The more solid the base the bigger the jump” or we’ll enter the discussion of what “bigger base” means and when a “bigger base” gives more support for the next jump, etc. And my most common discussion is the “People are good” (the Respect pillar) assumption. Which should be written as “Always assume people are good” (even or particularly when their behaviour indicates otherwise). This is an assumption to guide one’s behaviour in respect to others, and not a statement on the nature of people. That’s why I usually write it starting with “Always assume…”. I appreciate your thoughtful post, the topic is very important. I have to agree with what (I think) Humberto says: you haven’t defined the boundaries of TOC. In fact, you’ve explicitly avoided it. That’s ok from the perspective of the TOC community itself; many of us are happy with our intuitive ideas. The real problem comes if we want to sell TOC. If we can’t describe it in a way that someone without the intuitive grasp will understand, they will be inclined to dismiss it as a set (jumble? mash-up?) of tools, which it is; or a set of philosophical ideas, which it also is. I think the difficulty comes with the combination of these two: philosophy and tools. A lens through which to view the world, and tools with which to shape it. For example, Humberto’s suggestion of using the pillars would be reasonable, except that I don’t see where the tools fit. So … if a Just-in-Time implementation followed all the pillars, would it be TOC? The answer could be “yes.” Interestingly, I suspect the people who would be confused would not be the market, who for the most part don’t know about TOC anyway; but members of the TOC community. Suppose the answer is the lens: TOC is the search for focus, or the pillars, or maybe even the assumptions on the TOCICO web site. Before saying “done” and pouring a stiff drink, I suggest we then need to view traditional techniques like DBR and critical chain, maybe even JIT and agile, through that lens and describe them appropriately. Then we can sell the techniques, and their variations, with their place in the framework clear. There would be a lot of work here, but the truly hard thing would be the level of consensus required to get started. Rob, I agree that we need the lens. The Pillars define a set of generic beliefs. I think that the objective of TOC is to significantly and consistently achieving more of the goal of the organization. What we lack in the Pillars is the connecting practical insights like focusing on the weaknesses while looking for more opportunities for generating value to potential clients. I suggest to add to the pillars the belief in the power of cause-and-effect to analyze situations and ideas. I like also to add the insight of dealing with common and expected uncertainty as a basic insight. Eli – thanks for your efforts in form of these write ups. I want to add to your perspective in form of my view of TOC from China! I compare this question ‘what is and what is not TOC’ with “This is a Wave but not the Ocean”. When we try to limit the definition of subject matter by the boundaries of what has been defined already then we lose the bigger perspective. The fourth pillar (Never say I Know) defined by Goldratt, opens our thought to the unlimited. We should not restrict definition of TOC to the tools already described. I believe that current TOC tools are manifestation of a thought process that recognises and accepts the “WHOLE” and works on the “PARTS” with that understanding. We can never take out Part from the Whole. Part will always be recognised by the Whole. A wave will always be a part of the ocean! Pradeep, you raise an important observation that explains how come Goldratt has refused to define what is TOC. He wanted it to be unlimited. We can see the conflict here, because a methodology that is unlimited looks like a religion rather than practical management approach. So, I think we do need, at the very least, to define the boundaries, or rather when TOC is not applicable. The next step should be a better high level set of beliefs and insights that lead us to develop more and more practical tools. This is the basic conflict: TOC enthusiasts will prefer the philosophy, the market that we would like to adopt TOC will prefer to start with practical tools or insights. TOC is much easier to sell starting with critical chain or DBR, rather than a philosophy of everything. We could also think of the boundaries, not in terms of “when TOC is not applicable,” but in terms of “what is implied when you say you are using TOC.” This would be the lens. For example, have you determined the most important place(s) to focus? Are you thinking in terms of cause and effect? Have you taken into account uncertainty? Are you achieving ongoing improvement? I think this kind of boundary would need to answer some obvious questions, like: when is DBR TOC? Or when is Lean TOC, or Scrum, or Six Sigma? I agree with you Rob. Rob, I generally speaking agree with you. What we differ is: managers who face a problem look for specific solutions, not the philosophy. Consultants should look for the philosophy to know how to analyze a situation and whether certain changes to DBR or CCPM or the TP are required. The higher level management should be interested in Strategy and superior decision making and for that they need the philosophy, certainly not DBR or CCPM. Goldratt succeeded in the last four or five years of his life to attract more high level management and then the selling of the tools and the implementations were somewhat easier. However, difficulties in the implementation happened because the initial analyze was assumed to be complete and the implementation processes lacked the ability to analyze the warning signals on time. I think that if TOC would not go ahead with implementing Strategy, including developing the knowledge more and remembering “Never Say I Know” to be able to spot new problems and find solutions, then TOC will be forgotten in 10 years from now. To that we need the philosophy and we need to improve it. I called “boundaries” the areas that the methodology can be applied, but this is just a definition of a term and it could be defined differently. Certainly we need the lens you talk about to be able to identify faster and deeper what a specific solution, or a tool, requires in order to work well. I think I know why CCPM is TOC, but I still need to understand better when certain shortcomings emerge. When we’d be able to do it for tools who were developed by Goldratt then we will be able to analyze other methodologies, like Lean or Scrum, in the same way. What I predict will come out is that for some cases those solution apply well, and then they also conform to the TOC lens/philosophy, but in some other cases they do not. Hence, I think that defining the boundaries of when a methodology works well and when certain changes have to be introduced is so important. I totally agree with you…. well said!. This will be my favorite post for a long time. We need to work on strategy and understanding what tool we can apply (what, when, where and how)… and their boundaries, in order to assure TOC principles and its essence do not disappear. We never must stop to think (never say I know)… and when we take a specific Solution as a recipe we do that. If may be useful to differentiate ontology, methodology and epistemology . Ontology is the world as it is, epistemology knowledge of the world. Methodology is the means for gaining knowledge. Toc in my view is a set of tools to gain knowledge of the world. The three are linked as Margaret Archer argues “…the nature of what exists cannot be unrelated to how it is studied…the social ontology endorsed does play a powerful regulatory role vis-à-vis the explanatory methodology for the basic reason that it conceptualises social reality in certain terms, thus identifying what there is to be explained and also ruling out explanations in terms of entities or properties which are deemed non-existent” (Archer, 1995: 16-17). Archer works from a social realist position that privileges ontology. It assumes that the world preexists our social and historical analysis. Our knowledge of the world can lead to significant change of ‘the world’ but such change is not automatic and would be traceable over time. Knowledge is social and cumulative, it is transitive. the real world that is addressed is relatively enduring and intransitive, it can be changed by our knowledge of it but not necessarily so. It is important that ontology and epistemology be differentiated. There will be areas where Toc is more likely to be successful and these are the areas that practitioners will inevitably focus in. But toc also has things to say about the world in general. Maybe the pillars should be seen as part of a heuristic to determine those areas most likely for success. They are however not the world as it is, they are part of the transitive knowledge domain, not the world itself. Great post, philosophy is important since we all have one whether we acknowledge it our not. A realist approach sees the world preexisting the social analysis of it. Under this view Toc is a way to know the world. The four pillars can then perhaps be seen as a heuristic to define those contexts where Toc would be likely to be most effective. These are the areas that practitioners would naturally most likely work in. Knowledge of the world is always partial, fallible and incomplete. It is social historical and transitive. Certain realist approaches argue for epistemological relativism, suggesting that the world can only be known under particular descriptions, there being no single gods eye view of the world. I’m not sure that Toc follows this argument. It does tend to suggest an Objectivism about its conclusions I think. I think it is important to differentiate ontology and epistemology. The realist would see the world preexisting the social analysis of it. Our knowledge of the world may change it but this is not always the case. If we see Toc as a means of knowing the world then we see that the pillars are guidance as to where we might be most effective. This is not to deny that Toc can be effective in other areas, the pillars just defining where we better focus our scarce resources. By focusing on these areas we are most likely to change the world over time, if the conditions for change are right. Toc as a way of thinking can be applied anywhere though independent of practical utility. ontology and epistemology though are linked and it would be useful to examine the (implied?) ontology of Toc. I don’t think this has been done very well to date. I like this quote from Margaret Archer ‘…the nature of what exists cannot be unrelated to how it is studied…the social ontology endorsed does play a powerful regulatory role vis-à-vis the explanatory methodology for the basic reason that it conceptualises social reality in certain terms, thus identifying what there is to be explained and also ruling out explanations in terms of entities or properties which are deemed non-existent” (Archer, 1995: 16-17). I don’t think we disagree about people wanting specifics. Even consultants have specific cases they are trying to solve. For me, there are two purposes for such a boundaries discussion. One is to be able to judge: is this tool applicable? That also helps us to understand what we need to do to expand its use. The second, I believe more important and more fundamental, is to be able to say: here is what TOC is. Without that, it becomes very difficult to sell. Definitely TOC needs to grow, but first we need to understand what it is that is growing. I think it unlikely that without Strategy, TOC will be forgotten in 10 years. I do believe that if we can’t sell it, it will die out. And if we can’t define it, it’s going to continue to be hard to sell. The 4 (or 5) pillars sound more like motherhood and apple pie. Who is going to argue against them? Don’t you need a more useful definition of TOC? We do need a useful definition of TOC in order to sell TOC. I don’t need the definition in order to think and progress based on what I have learned from TOC. From my perspective what I do is “TOC”, without the need to define or “prove” that it is “TOC”. I do need to prove that what I do brings value. Regardless of why you need useful definition of TOC, the pillars are a useless construct. Maybe there needs to be a clearer separation between the world and our knowledge of the world. Toc resides in the knowledge domain, it is part of a social process. If we accept this then we can ask questions such as: Under what conditions is toc possible? What must the world be like for toc to be possible? Constraints then maybe become real deep mechanisms that exist independently of our knowledge of them. They are triggered in certain contexts. Knowledge of them is the first step in changing them. They are visible often only via their effects (an observable bottleneck?). The theory of constraints is a set of explanatory tools to expose and change these mechanisms for various purposes. Eli – to your comment about the “People are Good” belief, I’ve always found it more useful to state this as “People want to do the right thing.” Of course that’s not always true either, but in general it helps remind you of the need to look for the policies, procedures, and norms that prevent people from doing the right thing.